Foto Friday CXXVI – ..:: NJ Brideau ::.. 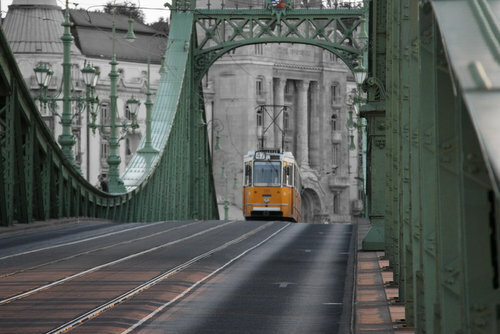 This is the Szabadság híd (Liberty or Freedom bridge) in Budapest, Hungary, which is over 100 years old and carries pedestrians, cars, and trams between Buda and Pest. The buildings in the background are part of the famous Gellért Thermal Bath hotel site. I like bridges in general, but I also liked this one because it looked much different to the rest of those crossing the Danube, and it looked just as nice at night as during the day. I got lucky with this picture, as the traffic broke as I was crossing the street and I managed to capture one of the older trollies. I was trying to get the bridge in a sunset picture, but the best I could do was catch the orange rays coming through the iron supports in the foreground. 1/250s f/5.6 170mm ISO 1600. Selective coloring. Au revoir until next week.